The Pragma Bed frame is engineered to provide maximum comfort during your most relaxing hours of the day, and versatile enough to be quadruple folded in under 15 seconds. They can then be store in a bed or closet, since a twin-sized Pragma Bed frame only requires 39.5 In. x 21.75 In. x 5.25 In. of storage space. Speaking of storage space, the Pragma Bed base provides you with more space than many other beds out there. It sits 14 In. off the ground, creating 21.875 cubic feet of storage space per twin bed frame. Think of what you can do with all that additional space. Pragma Bed bases do not require a box spring. The Pragma Bed bed base is engineered with heavy-duty wire mesh, which serves as a complete mattress support system that will not bend or sag over time. Our bed bases provide a flat, sturdy, squeak-free base for your new memory foam mattress or even your old spring mattress. Our strong yet lightweight design can resist up to 1200 pounds per twin bed frame up to 2400 pounds on the king-sized base. The weight of our twin bed frame starts at a very light 23.75 pounds. Pragma Bed frames are strong enough to withstand jumping, yet light enough to be carried up the steps. Assembly is never a concern with Pragma Bed bases: no tools are required to put one together. All you need to do is pull it out of the box, unfold it, and place it in its designated space. If you wish to store your Pragma Bed frame, just fold it up and hide it away. All bed frames, except the twin-sized frame, comes in packages of two bed frames that once joined make up their desired bed size. For example, for a queen-sized bed, our customer will receive two bed frames that folded together have the following dimensions: 30.25 In. x 23 In. x 10.75 In. and weigh a total of 36.8 pounds. Lightweight, strong, and easy to assemble: that is a Pragma Bed. We Recommend You Purchase The Rolled Mattress In A Box Because It Stores Easily In A Box. Commercial Grade Manufactured in the United States from domestically procured and inspected materials. Extra Heavy duty for years of use! 1 In. x 16 gauge zinc plated steel tubing will not rust, pit, peel or discolor. Automatic opening and folding, with 9 gauge Z hooked, zinc plated NO-SAG wire. Supra-Loop is the same patented suspension system used in upholstered furniture and automobile seating; it provides superior and long lasting support. Bed stands on our 4 In. ball-bearing hard composite tires for easy maneuverability. Furnished completely assembled and with 6 In. thick, 1.35 density poly foam mattress. The mattress cover is zippered, double sided, 8 gauge STAF-CHECK hospital grade green vinyl. The mattress cover is repairable before it is replaceable by using duct tape from the inside and comes complete with a full envelope zipper for easy repairs. Sizes: 30 In., 39 In., or 48 In. wide; all 72 In. long. STAF-CHECK is the same patented product used in hospital beds. A 250 pound weight limit is suggested. When folded, bed measures 50 In. high, 18 In. deep, width varies 30 In., 39 In. or 48 In. according to model. 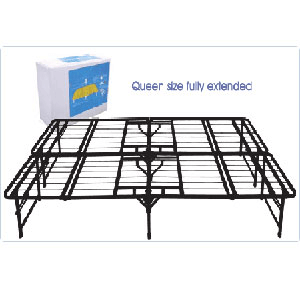 The height from the floor to the top of the mattress is 16 In.Mattress and Cover is FIRE RETARDANT - Tested meeting USA and California Laws.Click Here For Compliance Certificate, Click Here For Fire RatingQuantity Discount Available. Comfort center support coils for maximum comfort.Versatile available in three sizes 30 In. 39 In. 48 In. x 75 In. Long.Sturdy Construction 1-1/2 In. x 1-1/2 In. angle steel.Fast Setup Legs automatically lower as unit is opened.Swivel Casters Medium Hard rubber with full ball bearing swivel.Steel Angle Frame Double braced Steel angle frame gives extra rigidity and long life.Available with a Premium 4 In. Foam or 5 In. Inner Spring Mattress (Included In the Price).1207 Conversion Kit Optional kit for adding two 8 In. wheels for ease of mobility (Included in the price). Complete with axle, wheels, and nuts. Fits beds 1230,1231 and 1232 only. These beds are drilled to accommodate this kit. The height from the floor to the top of the mattress is 17 In. Made in U.S.A. Commercial Quality for Hotels/Motels 280 lb. rated capacity Ideal for home use, will last many years Mattress and Cover is FIRE RETARDANT - Tested meeting USA and California Laws. *In stock. This product normally leaves our warehouse within 1-2 business days. * Quantity Discount Available. 4 In. Foam Mattress; swivel casters; link or poly support deck; and automatic leg opening.Available in 30,39 and 48 Wide. The length is approx. 72. * Helically suspended poly fabric deck. * Sturdy, mobile, and extremely durable. * Double braced angle steel frame provides strong, durable support for years of use. * Fast Setup - Automatic leg lowers safely into position; fold in for storage. * 1-5/8 Swivel casters for easy movement.• Mattress and Cover is FIRE RETARDANT - Tested meeting USA and California Laws. *In stock. This product normally leaves our warehouse within 1-2 business days. * Quantity Discount Available. 5 In. Innerspring Mattress; ball bearing rollers; Polypropylene support deck, and automatic leg opening. Available in 30 In., 39 In. and 48 In. Wide. The Length is approx. 72 In.. * Poly deck support surface will not rust and provides total coverage support for the mattress. * Extremely mobile with Lite Touch Casters. * Sturdy tubular frame is strong, lightweight and easy to handle. * Crossed Center Support enhances strength and durability. * Fast Setup leg automatically lowers as unit is opened.• Mattress and Cover is FIRE RETARDANT - Tested meeting USA and California Laws. *In stock. This product normally leaves our warehouse within 1-2 business days. * Quantity Discount Available. Folding Bed Frame with Wooden Slats and Metal Frame. Solid construction will allow for a very quite Bed. Easy to assemble. Can by used as a stow away bed. Available in Twin/Full, Queen or King Size. No Box Spring is necessary with this frame.